The open edition print versus limited edition print debate for digital fine art giclee prints may never be resolved. Visual artists need a clear comfortable stance. When it comes to digital fine art giclee prints, readers who follow this blog know I hold strong opinions about using open editions for marketing them. There is no single solution on the open vs. limited edition debate. It’s not that I am against tradition. It’s more that I believe the arguments for using open editions outweigh those for continuing to use them. I also am the first to admit there is no 100% solution for all artists. How could there be when there is ample evidence there are many artists who continue to effectively market their fine art giclee prints. There are believable points and great examples to support both sides of the debate. In recent days, I have been reminded about how some artists are doing well in open editions while others are profiting from limiting editions. 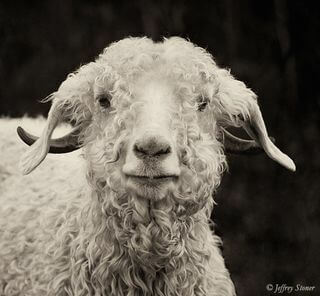 Here is a note from fine art photographer, Jeffrey Stoner. He is a long-time follower, friend and supporter. “Your writings about limited vs. open edition prints were one of the deciding factors in my choice to go to open prints in 2007. It was definitely the right decision. 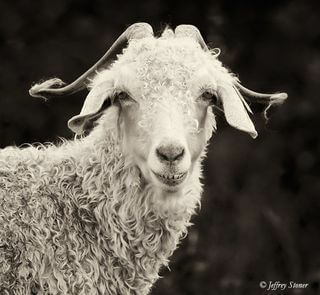 I began a series of Angora Goat images in 2008. There are now five in the series. The goats are part of a 10-year experiment to control the growth of Canadian blackberry bushes on the open balds. The balds are treeless mountain tops and the one they are on is at 5800’ along the Appalachian Trail on the Tennessee / North Carolina border. The goats are brought to the mountain top on the first day of summer and come back down the last day of summer. The series took off and the first goat image (Arlo) which I made in 2008 was my best selling image of all time with 9 months. If I had limited the sales of this, and succeeding, goat images I would have lost a lot of income. I’m an artist advocate and I don’t believe artist should have to arbitrarily cap their income by limiting how many copies of their work get sold. I believe most collectors will buy open editions as freely as limited, or that the upside on the open will exceed the loss on the limited. In an age of digital printing where even lightly informed buyers understand there are no actual limitation to possible number of prints produced, it seems somewhat disingenuous to be selling limited editions. I have more the argument, you can read about it in this post, The Double Entendre of the Visual Artist Selling Out Redux, or get more perspective on any of the posts here. Roger is in touch on a regular basis with some very successful fine artists and fine art photographers. He made the powerful point that his best customers, those who place the most frequent orders, nearly all sell their work in limited editions. He gave me the example of the fabulous oceanic photographer, Marc Montocchio who has a limited edition print on metal of a live marlin in its natural habitat in the ocean. This is a one-of-a-kind piece. He is selling a very limited edition run of the image, and stands to make a boodle doing it. You can view the YouTube video on how the image was taken here. So, I get it. I can look at artists like Ford Smith, Jennifer Vranes, Yuroz and countless more who are profiting in the limited edition market. It proves it is not an open and shut case. My only retort to such overwhelming evidence of success is to question how much money those artists lose by capping their income. The heirs of Maxfield Parrish and Ansel Adams continue to get royalties from their estates. If these artists had opted for limited editions of their work. The income from those original prints would have long ago dried up. I’ll leave it at that. As always, I know you will come to your own informed decision. Two competing ideas that are both wildly successful are Art That Fits, a company owned by Larson-Juhl, the world’s largest supplier of picture frame moulding and supplies. It is notably owned by Warren Buffett’s Berkshire Hathaway group. Art buyers can browse its site and order open edition prints in a variey of sizes. The other is Jen Bekman’s 20×200.com site that sells very limited editions. It has enjoyed VC investments in the millions. She is proving the argument for limited edition prints. And, the debate goes on…and on. P.S. If you live in the U.S., you can order a free sample kit from Image Wizards. International orders pay a small shipping fee to have the samples sent to them.